On Monday 4th February, I attended the third annual PQs lunch when thirty-eight of the sixty-five PQ subscribers attended. The PQs, or the Postquincentennial Fund to give its full title, is the successor to the very effective 500 Club which funded the celebration of the Company’s 500 Anniversary. The PQ subscribers are Freemen who have volunteered to subscribe £15 per month to improve the financial health of the Company or to develop Watermen’s Hall and its assets. The PQs meet at an annual lunch to vote on the next project, and this year, having had a report from Craft Owning Freeman Sinead Hayes about the tabards for Watermen’s crews (approved last year), heard a brief presentation from Court Assistant Annamarie Phelps about the proposed refurbishment of the Freemen’s Room, last redecorated in 1998. After lunch, those present voted unanimously for the refurbishment, a decision confirmed by most postal votes from those unable to attend the lunch. It is proposed to do the refurbishment over the summer break. 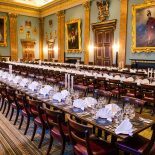 On Wednesday of that week, I attended a Court Lunch at the Worshipful Company of Carpenters in their splendid hall. A few weeks earlier, I had been asked if I would be prepared to reply on behalf of the guests and, having been assured I would get a full briefing, I agreed. Our Clerk then left for two weeks in India so when the brief arrived from the Carpenters, I opened it in hope of some inspiration…. It’s probably worth repeating verbatim: “I suggest that you respond briefly. No toast at the end – merely end with an appreciative flourish so that we know to burst into thunderous applause!” Devoid of any other ideas, I drafted a three-minute talk on the challenges of speaking at a lunch when one can never be quite sure how to pitch it until one has arrived and can gauge the audience. It appeared to be acceptable: no one heckled and there was applause, even if not exactly thunderous. Less demanding was dinner with the Worshipful Company of Coopers that evening. It was a Masters’ & Clerks’ dinner so there were lots of familiar faces. The meal included garlic snails which caused some amusement as they divided those at my table into those who greeted them with relish – and those who didn’t. The speaker was the CEO of Surrey County Cricket Club and my initial thought was that I might need to know something about cricket, but he spoke very entertainingly about his two career ‘disasters’: the siting of a grandstand slightly misaligned with the pitch and the rebranding of a club which had proved very unpopular with those tattooed with the previous badge! On Thursday, I was invited to join a Livery Committee Liaison Lunch at the City Livery Club. Three other Masters had been invited with Ms Fiona Adler who I knew from last year’s Sheriffs’ Row. The lunch was a forum to discuss matters of mutual interest and so we covered topics such as where to recruit new Freemen, the pan-Livery initiative, membership subscriptions and whether ‘White Tie’ discouraged attendance at City dinners. As always, it was interesting to hear everyone’s views, but it made me very aware of how fortunate the Watermen & Lightermen are in having an active trade and thus retaining our working role. On Tuesday 12th I attended the Worshipful Company of Pewterers’ Livery Dinner – another Livery Hall that I had not visited before. Several other Masters and Clerks were also invited so there was the inevitable catching up on who had been where in the previous few days. I caught up on the Pewterers’ activities with Liverymen seated nearby; naturally they still encourage design in pewter, but their main charitable activity is funding children, who would not otherwise be able to afford the fees, to attend the sixth forms of top-flight London schools. After dinner, I was also able to catch up on news of the Pewterers’ affiliated regiment, the Royal Scots Dragoon Guards; I had last encountered them when I was serving in Germany in the 1970s. That was my last engagement of that week, perhaps because of half term, so I retreated to Henley for a long, quiet weekend, coming back to London the following Tuesday for Worshipful Company of Basketmaker’s celebration of their 450th year with a trade fair, Basketry: Weaving the Cycle of Life, in the Old Library at Guildhall. 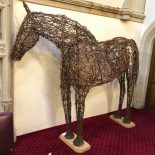 This was an exhibition to astound those who might have thought that basket weaving had its limitations: there were clothes, coracles, a life-size horse and many, many amazing baskets – and very good refreshments. However, it wasn’t practical to over-indulge because that same evening was the Company’s own Annual Dinner held, as always, at Fishmongers’ Hall. 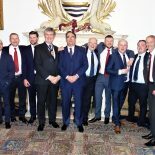 The Annual Dinner is the major event of the Company’s year with over 180 Freemen and their guests attending – and thus probably the most nerve-wracking for any Master. Fortunately, everything went very smoothly thanks to the organisation of the Company’s staff and I was fortunate that the principal speaking guest, Sir Peter Bazalgette, was someone I know very well. Sir Peter, besides being a very successful television executive and chairman of a number of distinguished national organisations, is the great-great-grandson of the eminent Victorian civil engineer, Sir Joseph Bazalgette whose work had such an impact on the cleanliness and physical structure of the Thames. Sir Peter spoke, with no notes, eloquently, entertainingly and enthusiastically about the work of his forebearer – no mean feat when the core subject is sewage! The following morning, I went to Guildhall for a Freedom ceremony. Technically, I was not attending as Master but, as the candidate Elizabeth Spill is an old friend and was taking the Freedom in anticipation of applying to the Company, it seemed proper to attend. For anyone who has not taken or witnessed the Freedom of the City of London, it is a relatively simple event. Escorted into the Court by the Beadle in top hat and frock coat, the candidate makes their declaration in front of the Clerk to the Chamberlain and then receives their copy of the Freedom on parchment: a simple but fun occasion. In the evening, I attended a Masters’ & Clerks’ Dinner with the Worshipful Company of Dyers held not in their own Hall, which was undergoing some reconstruction, but at the Innholders. The invitation had instructed us to wear some item of clothing demonstrating the dyers’ art but, having always abided by Past Master Gordon’s dire warnings about coloured bow ties et al, I couldn’t muster very much from my wardrobe. I settled for a pair of sedate Regimental socks (blue red blue) – but was nowhere in the league of colour paraded at the reception: jackets, ties, handkerchiefs all in garish shades. First prize was won by the Master Tallow Chandler: a Scot in highlander’s trews. The Master of the Dyers admitted he was a little colour blind and that was probably a blessing. 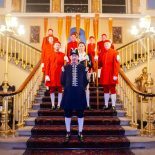 Serendipity, having seen so much emphasis on the working river, the following evening was the first dedicated Journeymen’s Dinner at the Hall. My predecessor, Simon McCarthy, initiated the objective of encouraging more participation by the Journeymen Freemen but this was the first occasion when a formal event had been organised for them. Participation was not as good as we hoped – six people had to cancel early in the week because of work when Friday 22nd proved to be a very popular night for bookings on the river. Nevertheless, thirty-nine attended and for many of the wives and partners it was their first time at the Hall. All enjoyed the three-course dinner and it was agreed that another similar event would be organised in the autumn. On Tuesday 26th February, Susan and I attended an afternoon tea organised by the Worshipful Company of Spectacle Makers at Bakers’ Hall. The event was aimed principally at Mistresses and Consorts, but Masters were permitted because the objective was to raise awareness of hearing loss. We had a very informative introduction by the Mistress Spectacle Maker and then a musical recital. We all left much better informed about the challenges of hearing loss. My last event of the month was on Thursday 28th at Guildhall: the annual Tacitus lecture, organised by the Worshipful Company of World Traders, and delivered by Mme Christine Lagarde, Managing Director of the International Monetary Fund. The Guildhall was packed, it was rumoured that there were 800 present and the seating was tighter than a Watermen’s Christmas dinner, but thankfully Mme Lagarde knew her audience; her opening question was why the banker character in Mary Poppins was the villain, “cheating his way to a fortune”? Did this not indicate that the financial industries had a serious image challenge? It was a good start and she kept us entertained with a stimulating speech about what had not been learnt from the crash of 2008 – a suitable closure to an interesting month.